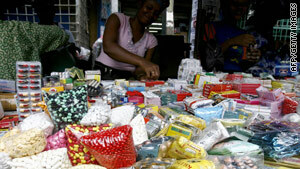 Women sell smuggled, counterfeit medicine in June 2007 at a market in Abidjan, Ivory Coast. (CNN) -- Authorities have seized 9,072 kilograms (20,000 pounds) of counterfeit medicine and arrested 80 people suspected of illegal trafficking in six East African nations, Interpol said Thursday. More than 300 premises were checked or raided in the two-month operation across Uganda, Burundi, Kenya, Rwanda, Tanzania and Zanzibar, according to a news release from the international police agency. The confiscated loot included anti-malaria drugs, vaccines and antibiotics. There was also a significant quantity of government medicines diverted to illegal resale markets. It was the third such seizure operation in as many years in East Africa, intended to curb the manufacture and distribution of counterfeit medical products. Representatives of the six nations are scheduled to meet in Zanzibar next week to discuss the seizure and the extent of the counterfeiting problem, Interpol said. The World Health Organization defines counterfeit drugs as "medicine, which is deliberately and fraudulently mislabelled with respect to identity and/or source." Counterfeiting can apply to both brand-name and generic products, and forged products may include those with the correct ingredients or with the wrong ingredients, without active ingredients, with insufficient active ingredients, or with fake packaging, WHO says. The United Nations agency created a global task force in 2006 to deal with the problem, which has been growing as international markets expand and become globalized and internet commerce has taken off. The fake products can prove detrimental to public health efforts in disease-ridden countries and in worst-case scenarios can cause death, according to the WHO task force.